Whether you wish to have an informal beach wedding or a free flowing dining extravaganza, our staff will create a memorable wedding celebration that will be uniquely yours. We have established a reputable place in the heart of the Todos Santos community and we have forged relationships with artists, caterers, chefs, inn keepers, photographers, beauticians, musicians and organic farmers and we are pleased to offer recommendations. • Surfing Lessons, Kayaking & Snorkeling. We welcome your inquiry. For detailed estimates we charge a consultation fee. For production and design services, we are flexible and charge by the event, by the day or by the hour. 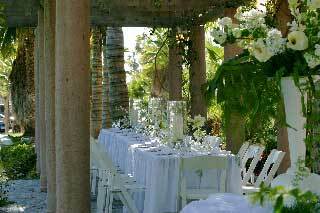 Email or telephone for our reasonable rates and start planning your Todos Santos event today!